Who’s ready for something new?!? After a ton of regular braided hairstyles I thought it’d be fun to change things up! 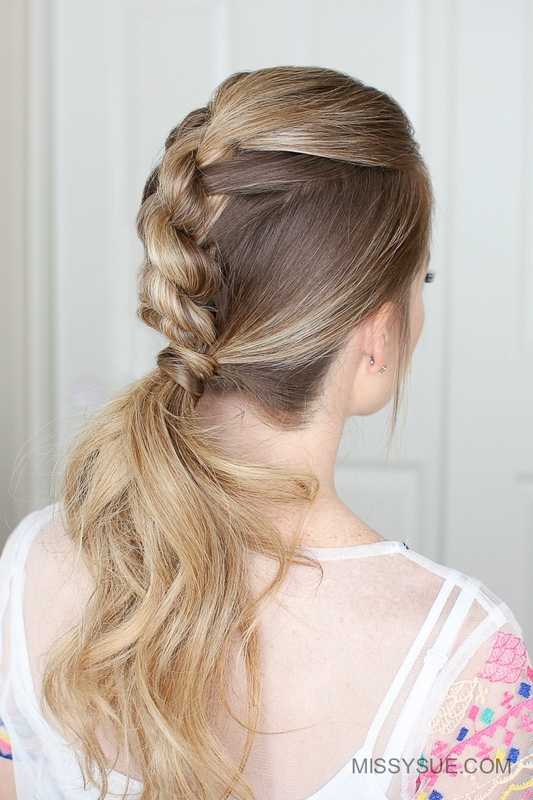 These three hairstyles would be so fun for summer and are so super easy to do once you get down the twisting technique. I love all three of these so much and am excited to wear them more once the weather really heats up! Step 1 / For this hairstyle start with a part on the right side and then pick up a section on the left side and divide it into equal sections. Step 2 / Now cross the left strand over the right strand. Step 3 / Now add in new sections to both sides and cross the left strand over the right strand again. Step 4 / After each cross over add in new sections to both sides and cross the left strand over the right strand, continuing the twists down to the left ear. Step 5 / Now angle the braid towards the back of the head and only add in hair to the right strand. Step 6 / When the twist reaches the middle of the back of the head, stop adding in new sections and continue the twist down to the ends. 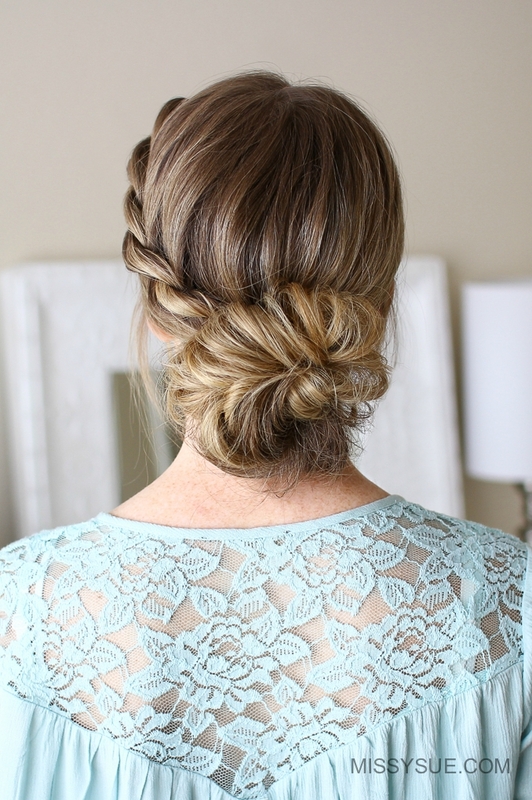 Then secure the bottom with two criss crossed bobby pins. Step 7 / Now repeat the same steps and create a second rope braid on the right side of the head. 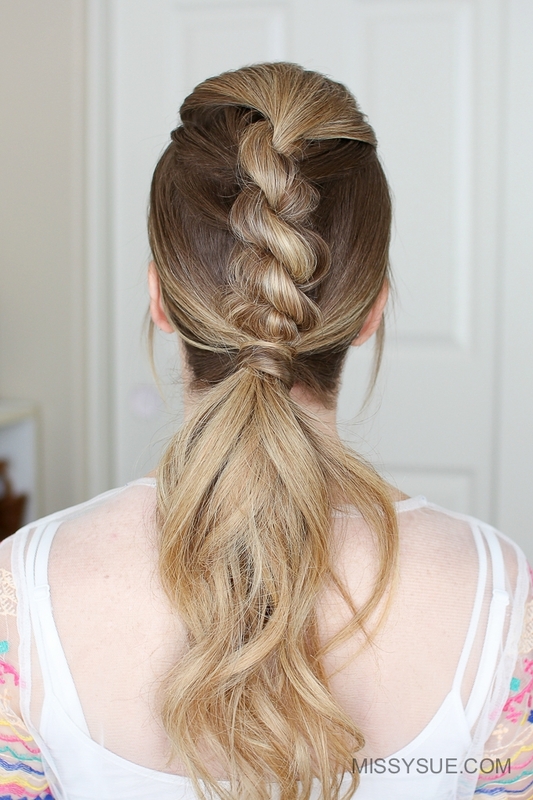 Step 8 / When both braids are done, create a gap in the right braid and pull the left braid through the gap. Step 9 / Then pin the two twists against the head with several bobby pins. Step 10 / Remove the bobby pins from the ends of the braids and then go back over the twists pulling on the edges to make them a little bit bigger. 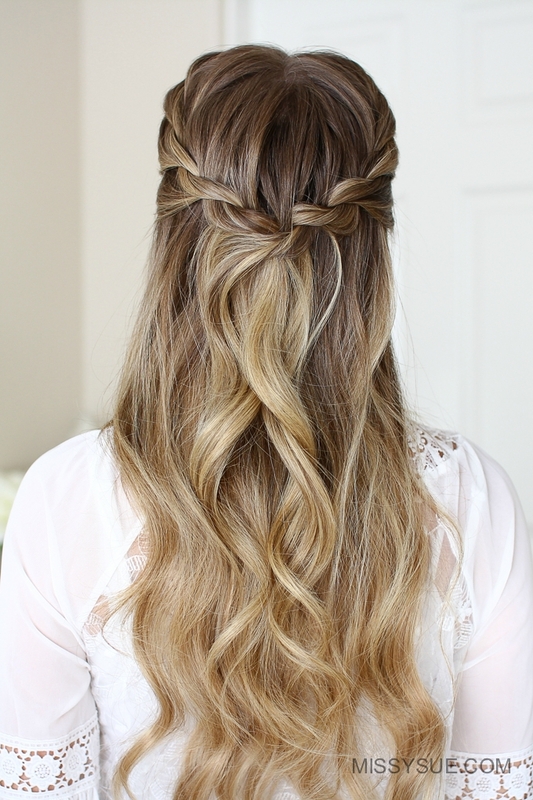 Step 1 / For this hairstyle start by parting your hair where you normally prefer. I put mine on the right side. Step 2 / Then pick up a section on the left side of the part and split it into two sections. Step 3 / Begin by crossing the front strand over the back strand. Step 4 / Next add a new section of hair to both sections and cross the front strand over the back strand. Step 5 / So now repeat the same steps adding new sections to each side, crossing the front strand over the back strand until the braid reaches the ear. Step 6 / Then continue the rope braid until it reaches the end of the section and then cross two bobby pins over the ends so it doesn’t unravel. Step 7 / Next combine the braid with the remaining hair and wrap it once with a hair band. Step 8 / Then wrap the hair band once over the dominant hand and spread the ponytail up and around the hair band. Step 9 / Then wrap the hair band twice more over the hair to create the base of the bun. Step 10 / Now pull on the edges of the bun to make it fuller. Step 11 / Then take the ends left sticking out and tuck them into the hair band to form loops at the top of the bun. Step 12 / Then set the style with hairspray. Step 1 / For this hairstyle start by dividing off a triangle shaped section of hair at the crown. Step 2 / Clip up the top section and tie the bottom section out of the way. Step 3/ Let down the top section and pick up a section at the crown to begin the braid. Step 4 / Divide the section into two parts and cross the left strand over the right strand. Step 5 / Then add in hair to both sides and twist each section towards the left. Step 6 / Then cross the left strand over the right strand. Twisting to two halves before wrapping them over each other will help keep the rope braid tight so it doesn’t come loose. Step 7 / Continue the rope braid twisting the left strand over the right strand, bringing in new sections of hair until the hair from this top section is brought in. Step 8 / Then continue twisting the section a little further down and criss-cross two bobby pins over the ends. Step 9 / Now combine all of the hair together into a ponytail and tie it off with a hair band. 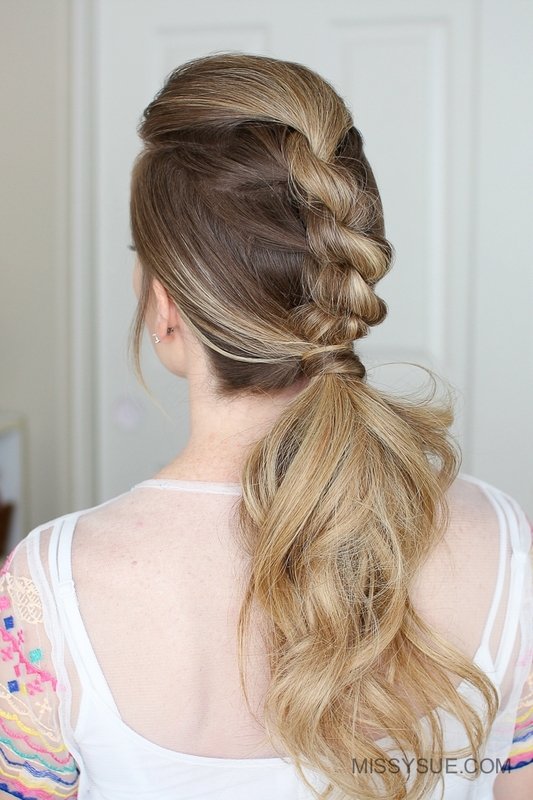 Step 10 / Remove the bobby pins from the twist and unravel the end of the rope braid. Step 11 / Then go back over the top of the braid and pull on the edges to make it fuller. Step 12 / To finish the style, wrap a small section of hair around the hair band and secure it underneath with a bobby pin.